Home » India. Coiffures, Hats, Head-dresses. 1. Coiffure of Hindu woman in gala dress. 2. Hindu Turban in three tiers. 3. Coiffure with band on the forehead and earrings, adorned with three peacock’s feathers. 4. Coiffure fixed with a diadem-shaped band. Jeweled ornaments. 5. Red hat adorned with a yellow chaplet, prettily draped. 6. Young woman of high birth, head covered with black transparent veil specked with yellow, true national costume. 7. Scarlet ribbon set very high. on the forehead and binding the hair. 8. Sort of turban showing the very black hair and projecting over the forehead. 9. Another turban similar in shape. The hair is coiled up into a knot on the top of the head. Huge ear-rings. 10. Blue, yellow and violet turban, tied on the head. 11. Very pointed cap, like the pontifical tiara, pink, embroidered with blue and yellow. 12. Hindu woman’s head, with voluminous coiffure in the shape of a peacock’s tail. Box-shaped ear-rings specked with white. 13. Hindu woman’s head with rather voluminous coiffure figuring a bird with head and neck emerging from its nest. Chinese influence. Common people used to let their hair wave in the wind, but the upper castes wore them in curls. They wore a sort of artificial hair similar to a wig. Peasant-women used to rub their hair with sesame-oil to make it glossy. Then they adorned it with flowers and leaves, but when in mourning, they let it hang in braids down their shoulders. They ornamented it with pearls and tiaras and to keep it in order tied round their heads bright-colored strings or ribbons. 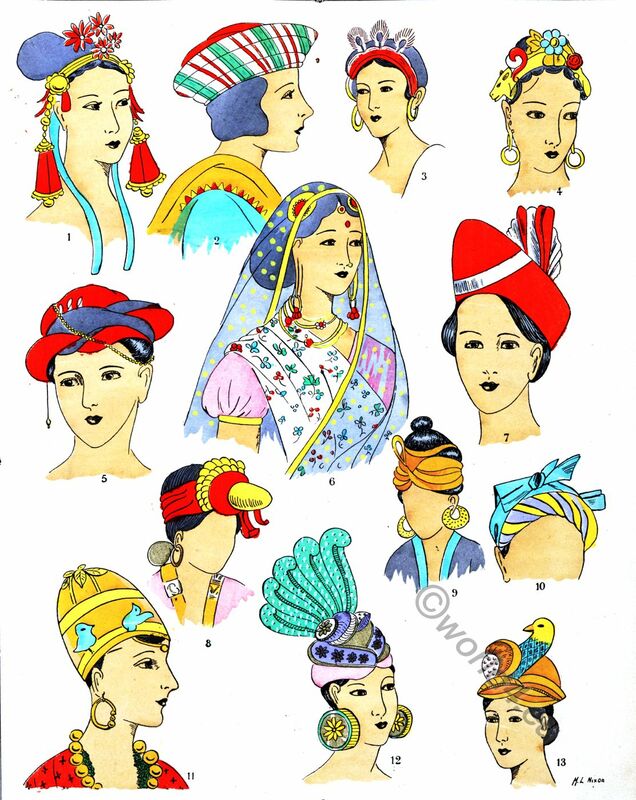 Their headgear was a cap closely resembling those worn nowadays by many Asiatic and Slavonic people, with whom the higher classes of Hindustan surely have a common origin. This cap is no longer seen, as the Orientals are influenced by the whims of fashion, both in dress and ornament. Those caps were sort of cylindric tubes, without any brim, rounded on the top of the head and fitting on the forehead and nape. They were more or less ornamented, and of different shapes, being ovoid or spherical. The diadems and bands were inlaid with gems and gold, and must have resembled those of the Greeks and Romans. In Afghanistan the women have very small silk caps, brightly colored, embroidered with gold and scarcely touching the forehead and ears. Their hair is divided in two long braids hanging behind. All Afghan women wear, as head-ornaments, Venetian sequins in strings, gold or silver chains ending in big balls which hang behind the ears. The rich turbans with a tuft on the top are reserved for kings. In some provinces of India the women have the queer habit of wrapping their hair in a white kerchief like our nuns! The girls wear a sort of square toque adorned with sequins, embroideries or gems, a rounded skull cap or a diadem of interwoven gold threads. Most of these women have adopted the bordered net on both sides of the forehead, that is, starting from the middle and covering the temples with drops and glass beads of all kinds and colors. Women of nearly all castes wind the mass of their black and lustrous hair into a coil behind the head, Those that can afford such luxury set a gold or gem ornament on the parting of the hair. A not unimportant part of their attire is the veil worn over the head. It is usually of light transparent muslin, and spangled with gold. At ceremonies the woman wears a gold crown remarkable for its delicate handiwork. It is worn rather on the back of the head and inclining to the left, and looks beautifully resplendent beside the dark hair it protects. Each point ends with a small triangle of red gold. It looks like a diadem made out of the petals of flowers. Another diadem is adorned with rubies above the twofold circle of guilloché oak-leaves whose points are protected with a colored stone. Another headgear worn rather on the back of the head like a halo, is also of pure gold and gems. Bristling with discs surmounted-with small leaves, strewn with rubies, it is embellished on the side with pampillas and plates reaching down to the lobes of the ears from which hang other jewels. Here, on the contrary, the arrangement of the hair is the only adornment. It is pulled out into a pair of flat bands forming at the back a thick and heavy roll in which flowers and numerous jewels mingle together. To complete the whole, some slashes and tattooing denote the caste and sect to which the fair Hindu belong. The hair in bands is covered above the temples with two discs of gold studded with precious stones. A veil is set in virgin fashion and falls back on the right and over the left arm in front. The Indian woman does not shrink from wearing a diadem of flowers over her lace headgear and her hair combed above the ears, which are left uncovered because they are adorned with glass beads and very broad rings. The turbans generally worn by men may be utilized for women’s head-dress. Big turbans are made of interwoven, puckered and puffed silks in which coloring and jewels are mingled.